Happy Wednesday! I am so filled with joy today! God is doing some amazing things in so many areas of my life especially in the area of the restoration of my hope and the strengthening of my faith. Things have been a little shaky the last couple of months but I made the decision at the beginning of the year to hold on to God and walk out His purpose and plans for my life no matter what it looks like. I want to encourage any of you who maybe going through a storm or are walking out purpose. Keep trusting God even if it looks like things in your life are dead. I pray that God will breathe new life into every dead place and restore the joy of your salvation!!!! Now on to the DIY portion of this post! Let me just say! I am loving upcycling! It is very gratifying and a wonderful way to challenge your sewing skills and creativity! One of my design instructors would say that you can only create what you know how to do. The more skills you have the more you can create! So true! Garment Inspiration/Description:This weeks DIY Fashion Remix is very easy and a beginner can do it as long as you have a sewing machine and can sew a line. I found this cotton dress in yellow and blue at the thrift store and paid $4.00 each of them. At first I thought is was handmade because one of them didn’t have the brand label in it. but then I found the second one and saw that it was made in Mexico by a label called Maria de Guadalajara (Maria from Guadalajara) not to be confused with Maria from Jalisco or Maria from Mexico City or any of the millions of Marias that exist in Latina America lol! (a little Latina humor. Maria is a very common Latina name. As a matter of fact its my middle name) I took a picture of the tag because it had a vintage quality that I really like. 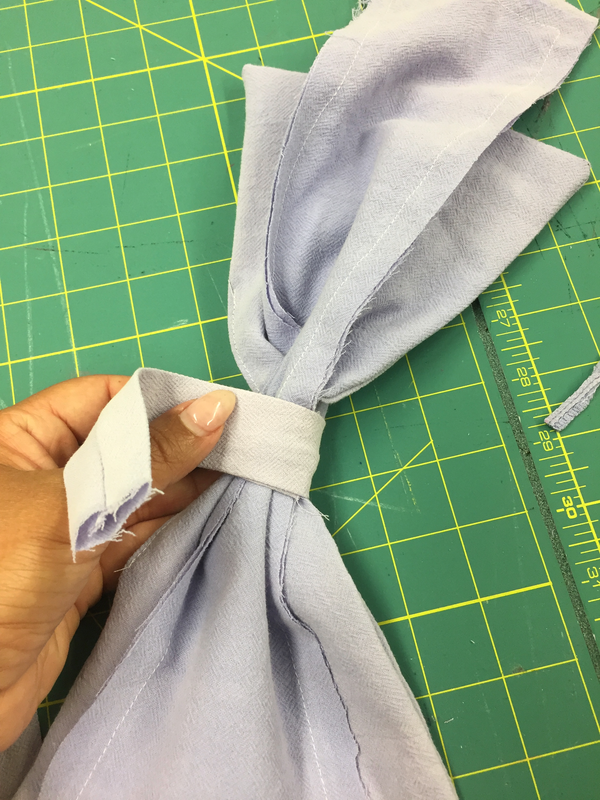 I was originally attracted to the simple aline sillohuette and instictinctively new that I wanted to make it a hi/lo top and I’ve been wanting to play with this shoulder bow embelishment thing that I’ve been seeing other bloggers and sewers playing with. And thought I could make a bow with the leftover fabric. However after taking it back to the studio I began to appreciate this garment even more for its fabric (Its made from 100% cotton). This dress was lovingly warn and washed quite a bit. The cotton is so soft which is a sign that its a quality cotton. Good cotton can stand up to a lot of washing and wearing and will soften with time. This fabric feels like silk thats how soft it is. At first I was going to just cut the hem and re-hem it with a clean finish. Then I thought that the worn look of the fabric and the natural fading of the dye pigments from wear would look better if I left the hem unfinished and just frayed the edges. So that’s what I did! I love! Love! LOVE!! this top! Its a perfect example of how simple can be beautiful! Below are the after shots. For the tutorial of this make just scroll past the photos. Skills used: I drew in a new hemline, I cut , I sewed. I then tried on my dress and measured down the front of the dress using a measuring tape from the center front neckline and down to wear I wanted the hemline at the front. I then did the same for the back starting the center back neckline. For me it was 18″ for the front and about 30″ for the back. I also added about 1/2″ extra for the fraying. I layed the dress flat on my cutting table folding the front pieces on top of each other and the back pieces on top of each other. Making sure that the side seams were lined up on top of each other and in the middle of the dress. Below is a labeled picture. I drew in a redline to highlight where the sideseams of the dress are. 3. With your hand, smooth out as much of excess fabric from the hemline as possible and match up the hemline and pin both layers together. This will help you to cut your fabric evenly. 4. Using your measuring tape, I measured from the center front neckline down to my desired hem length using the numbers I mentioned in step 2 and using a colored tailors chalk I marked the fabric with a small dot at my desired hem length (this is will be where my hi hemline starts). I then did the same for the back using the back hemline measurement (This is where my low hemline will stop). 5. Using a curved ruler (if you don’t have a curved ruler you can use a straight edge ruler and drape in the curve.) I began to draw a curved line from the hi point at the front to the lo point in the back. 7. I then stitched two rows of straight stitches to control the fraying at the hemline. 8. Using my finger nails and a seam ripper, I began to fray the hemline until it had my desired look. 9. I cut 4 rectangles from the left over fabric. 2 were 8″x14″(the bow) and the other 2 were 4″x20″ (the bow ends). 10. For the bow I took the 8x 20 rectangles and stitched them together leaving a small opening on one of the long edges. 11. I then turned the bow right side out through the small opening being careful to push out the corners. I edge stitched the opening closed. 12. 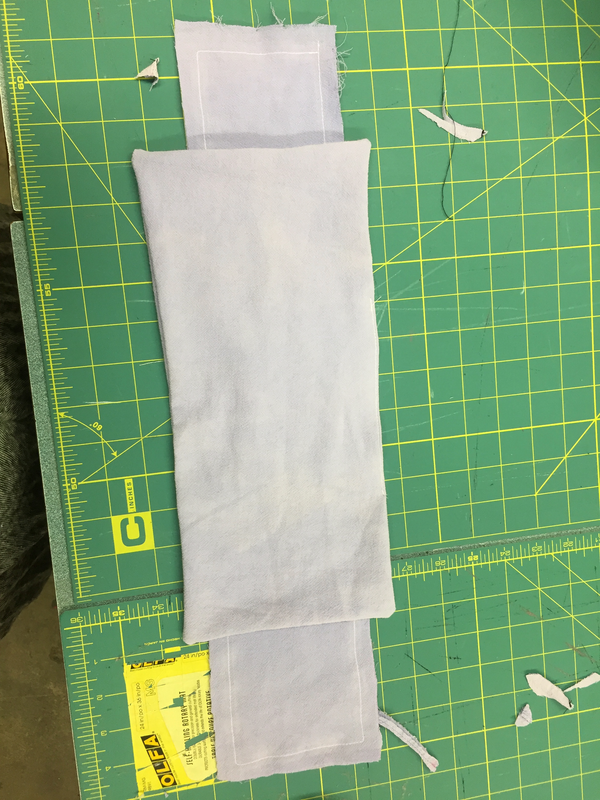 I then took the 4×20′ rectangle pieces and top stitched all the way around using a 3/8″ seam allowance. Because I planned to fray the edges of the “bow ends” I topped stitched all the way around. 13. I then layed the smaller rectangle (bow) on top of the longer rectangle (bow ends) and scrunched the bow together at the center. 14. 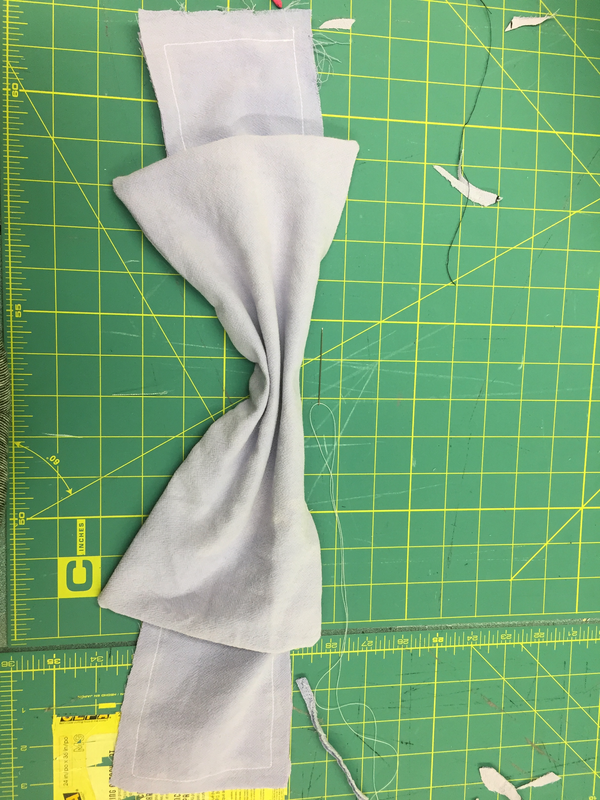 With a hand needle and thread I sewed through the scrunched center of the rectangles forming the bow. 15. I then cut a 3″x 8″ strip and sewed them together, turned it out and pressed it. This is the strip for center of the bow. 16. 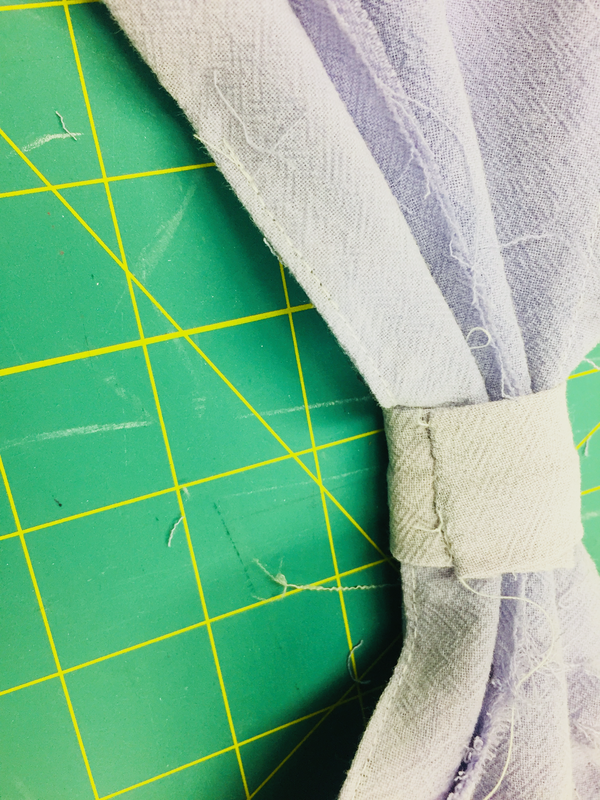 I then tightly wrapped it around the scrunched center of the bow, cut the excess fabric from the strip and turned under the raw edge about 1/4″ and handfinished the seam with a slip stitch. 17. Finally, I stitched the bow to the shoulder strap after I frayed the edges of the bow ends. That’s it! I hope you enjoyed this post! Make sure to check out my instagram page later this week to see how I styled this new blouse. If you’re enjoying what i’ve been sharing be sure to subscribe. all you need to do is enter your email under the follow me section. You’ll be able to see future makes and I promise not to send you any junk.